American Radio History website, https://doi.org/www.americanradiohistory.com. Dürr W., Dürr C., Ehret P. and Bosch E. 2015. “Thales 150 W C-Band radiation cooled Travelling Wave Tube”, 15th IEEE International Vacuum Electronics Conference 2015 Beijing, https://doi.org/10.1109/IVEC.2015.7223814. Gastaud J., Gérard E., Laurent A. and Stalzer H. 2014. “170W Ka-Band space TWT”, 14th IEEE International Vacuum Electronics Conference 2014 Monterey, https://doi.org/10.1109/IVEC.2014.6857480. Highstrete B. A. and Grabowski K. P. 1962. 1962 International Electron Devices Meeting, https://doi.org/10.1109/IEDM.1962.187332. IEEE 2003. 521-2002 - IEEE Standard Letter Designations for Radar-Frequency Bands, https://doi.org/10.1109/IEEESTD.2003.94224. Kempkes M. A., Hawkey T. J., Gaudreau M. P. J. and Phillips R. A. 2006. “W-Band Transmitter Upgrade for the Haystack UltraWideband Satellite Imaging Radar (HUSIR)”, IEEE International Vacuum Electronics Conference 2006, Monterey, https://doi.org/10.1109/IVELEC.2006.1666427. Minenna D. F. G., Elskens Y. and André F. 2017. 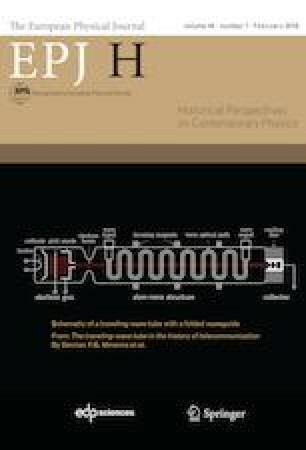 “Electron-wave momentum exchange and time domain simulations applied to travelingwave tubes”, 18 th IEEE International Vacuum Electronics Conference 2017 London, https://doi.org/10.1109/IVEC.2017.8289689. Philips Natuurkundig Laboratorium history website, https://doi.org/extra.research.philips.com. Tucek J. C., Basten M. A., Gallagher D. A. and Kreischer K. E. 2016. “Operation of a compact 1.03 THz power amplifier”, 17th IEEE International Vacuum Electronics Conference 2016 Monterey, https://doi.org/10.1109/IVEC.2016.7561772.